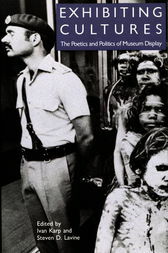 Debating the practices of museums, galleries, and festivals, Exhibiting Cultures probes the often politically charged relationships among aesthetics, contexts, and implicit assumptions that govern how art and artifacts are displayed and understood. The contributors—museum directors, curators, and scholars in art history, folklore, history, and anthropology—represent a variety of stances on the role of museums and their function as intermediaries between the makers of art or artifacts and the eventual viewers. Ivan Karp is National Endowment for the Humanities Professor of Liberal Arts at Emory University and director of the Center for the Study of Public Scholarship. Steven D. Lavine is the president of the California Institute of the Arts.